On 1 October 1942, the Bell XP-59A, America's first jet plane, took to the air over a remote area of the California desert. There were no official NACA representatives present. The NACA, in fact, did not even know the aircraft existed, and the engine was based entirely on a top secret British design. After the war, the failure of the United States to develop jet engines, swept wing aircraft, and supersonic designs was generally blamed on the NACA. Critics argued that the NACA, as America's premier aeronautical establishment (one which presumably led the world in successful aviation technology) had somehow allowed leadership to slip to the British and the Germans during the late 1930s and during World War II. In retrospect, the NACA record seems mixed. There were some areas, such as gas turbine technology, in which the United States clearly lagged, although NACA researchers had begun to investigate jet propulsion concepts. There were other areas, such as swept wing designs and supersonic aircraft, in which the NACA had made important forward steps. Unfortunately, the lack of advanced propulsion systems, such as jet engines, made such investigations academic exercises. The NACA's forward steps undeniably trailed the rapid strides made in Europe. During the 1930s, aircraft speeds of 300-350 MPH represented the norm and designers were already thinking about planes able to fly at 400-450 MPH. At such speeds, the prospect of gas turbine propulsion became compelling. With a piston engine, the efficiency of the propeller began to fall off at high speeds, and the propeller itself represented a significant drag factor. The problem was to obtain sufficient research and development funds for what seemed to be unusually exotic gas turbine power plants. In England, RAF officer Frank Whittle doggedly pursued research on gas turbines through the 1930s, eventually acquiring some funding through a private investment banking firm after the British Air Ministry turned him down. Strong government support finally materialized on the eve of World War II, and the single-engine Gloster experimental jet fighter flew in the spring of 1941. English designers leaned more toward the centrifugal-flow jet engine, a comparatively uncomplicated gas-turbine design, and a pair of these power plants equipped the Gloster Meteor of 1944. Although Meteors entered RAF squadrons before the end of the war and shot down German V-1 flying bombs, the only jet fighter to fly in air-to-air combat came from Germany --the Me-262. Hans von Ohain, a researcher in applied physics and aerodynamics at the University of Gottingen, had unknowingly followed a course of investigation that paralleled Whittle's work and took out a German patent on a centrifugal engine in 1934. Research on gas turbine engines evolved from several other sources shortly thereafter, and the German Air Ministry, using funds from Hitler's rearmament program, earmarked more money for this research. Although a centrifugal type powered the world's first gas turbine aircraft flight by the He-178 in 1939, the axial-flow jet, more efficient and capable of greater thrust, was used in the Me-262 fighters that entered service in the autumn of 1944. In America, the idea of jet propulsion had surfaced as early as 1923, when an engineer at the Bureau of Standards wrote a paper on the subject, which was published by the NACA. The paper came to a negative conclusion: fuel consumption would be excessive; compressor machinery would be too heavy; high temperatures and high pressures were major barriers. These were assumptions that subsequent studies and preliminary investigations seemed to substantiate into the 1930s. By the late 1930s, the Langley staff became interested in the idea of a form of jet propulsion to augment power for military planes for takeoff and during combat. In 1940, Eastman Jacobs and a small staff came up with a jet propulsion test bed they called the "Jeep." This was a ducted-fan system, using a piston engine power plant to combine the engine's heat and exhaust with added fuel injection for brief periods of added thrust, much like an afterburner. A test rig was in operation during the spring of 1942. By the summer, however, the Jeep had grown into something else --a research aircraft for transonic flight. With Eastman Jacobs again, a small team made design studies of a jet plane having the ducted fan system completely closed within the fuselage, similar to the Italian Caproni-Campini plane that flew in 1942. Although work on the Jeep and the jet plane design continued into 1943, these projects had already been overtaken by European developments. During a tour to Britain in April 1941, General H. H. "Hap" Arnold, Chief of the U.S. Army Air Forces, was dumbfounded to learn about a British turbojet plane, the Gloster E28/39. The aircraft had already entered its final test phase and, in fact, made its first flight the following month. Fearing a German invasion, the British were willing to share the turbojet technology with America. That September, an Air Force Major, with a set of drawings manacled to his wrist, flew from London to Massachusetts, where General Electric went to work on an American copy of Whittle's turbojet. An engine, along with Whittle himself, followed. Development of the engine and design of the Bell XP-59 was so cloaked in secrecy that the NACA learned nothing about them until the summer of 1943. Moreover, design of the Lockheed XP-80, America's first operational jet fighter, was already under way. General Arnold may have lost confidence in the NACA's potential for advanced research when he stumbled onto the British turbojet plane. It may be that British and American security requirements were so strict that the risks of sharing information with the civilian agency, where the risk of leaks was magnified, justified Arnold's decision to exclude the NACA. The answers were not clear. In any case, the significance of turbojet propulsion and rising speeds magnified the challenges of transonic aerodynamics. This was an area where the NACA had been at work for some years, though not without influence from overseas. As information on advanced aerodynamics began to trickle out of defeated Germany, American engineers were impressed. Photographs of some of the startling German aircraft, like the bat-like Me-163 rocket powered interceptor and the improbable Junkers JU-287 jet bomber, with its forward swept wings, prompted critics to ask why American designs appeared to lag behind the Germans. It seemed to be the story of the turbojet again. The vaunted NACA had let advanced American flight research fall precariously behind during the war. True, the effect of wartime German research made an impact on postwar American development of swept wings, leading to high performance jet bombers like the Boeing B-47 and the North American F-86 jet fighter. It is also the case that American engineers, including NACA personnel, had already made independent progress along the same design path when the German hardware and drawings were turned up at the end of World War II. The North American F-86 Sabre featured swept wing and tail surfaces. The plane shown here was fitted with special instrumentation for transonic flight research conducted by the Ames Laboratory. Like several other chapters in the story of high speed flight, the story began in Europe, where an international conference on high speed flight--the Volta Congress--met in Rome during October 1935. Among the participants was Adolf Busemann, a young German engineer from Lubeck. As a youngster, he had watched innumerable ships navigating Lubeck's harbor, each vessel moving within the V-shaped wake trailing back from the bow. As an aeronautical engineer, this image was a factor that led him to consider designing an airplane with swept wings. At supersonic speeds, the wings would function effectively inside the shock waves stretching back from the nose of an airplane at supersonic speeds. In the paper Busemann presented at the Rome conference, he analyzed this phenomenon and predicted that his "arrow wing" would have less drag than straight wings exposed to the shock waves. There was polite discussion of Busemann's paper, but little else, since propeller-driven aircraft of the 1930s lacked the performance to merit serious consideration of such a radical design. Within a decade, the evolution of the turbojet dramatically changed the picture. In 1942, designers for the Messerschmitt firm, builders of the remarkable Me-262 jet fighter, realized the potential of swept wing aircraft and studied Busemann's paper more intently. Following promising wind tunnel tests, Messerschmitt had a swept wing research plane under development, but the war ended before the plane was finished. In the United States, progress toward swept wing design proceeded independently of the Germans, although admittedly behind them. The American chapter of the swept wing story originated with Michael Gluhareff, a graduate of the Imperial Military Engineering College in Russia during World War I. He fled the Russian revolution and gained aeronautical engineering experience in Scandinavia. Gluhareff arrived in the United States in 1924 and joined the company of another Russian compatriot, Igor Sikorsky. By 1935, he was chief of design for Sikorsky Aircraft and eventually became a major figure in developing the first practical helicopter. In the meantime, Gluhareff became fascinated by the possibilities of low-aspect ratio tailless aircraft and built a series of flying models in the late 1930s. In a memo to Sikorsky in 1941, he described a possible pursuit-interceptor having a delta-shaped wing swept back at an angle of 56 degrees. The reason, he wrote, was to achieve "a considerable delay in the action (onset) of the compressibility effect. The general shape and form of the aircraft is, therefore, outstandingly adaptable for extremely high speeds." Eventually, a wind tunnel model was built; initial tests were encouraging. But the Army declined to follow up due to several other unconventional projects already under way. Fortunately, a business associate of Gluhareff kept the concept alive by using the Dart design, as it was called, as the basis for an air-to-ground glide bomb in 1944. This time, the Army was intrigued and asked the NACA to evaluate the project. Thus, a balsa model of the Dart, along with some data, wound up on the desk of Robert T. Jones, a Langley aerodynamicist. Jones was a bit of a maverick. A college dropout, he signed on as a mechanic for a barnstorming outfit known as the Marie Meyer Flying Circus. Jones became a self-taught aerodynamicist who couldn't find a job during the 1930s depression. He moved to Washington, D.C., and worked as an elevator operator in the Capitol. There he met a congressman who paid Jones to tutor him in physics and mathematics. Impressed by Jones's abilities, the legislator got him into a Works Projects Administration program that led to a job at Langley in 1934. With his innate intelligence and impressive intuitive abilities, Jones quickly moved ahead in the NACA hierarchy. Studying Gluhareff's model, Jones soon realized that the lift and drag figures for the Dart were based on outmoded calculations for wings of high-aspect ratio. Using more recent theory for low-aspect ratio shapes, backed by some theoretical work done by Max Munk, Jones suddenly had a breakthrough. Within the shock cone created at supersonic speeds, he realized that the Dart's swept wing would remain free of shock waves at given speeds. The flow of air around the wings remained subsonic; compressibility effects would occur at higher Mach numbers than previously thought (Mach 1 equals the speed of sound; the designation is named after the Austrian physicist, Ernst Mach). The concept of wings with subsonic sweep came to Jones in January 1945, and he eagerly discussed it with Air Force and NACA colleagues during the next few weeks. Finally, he was confident enough to make a formal statement to the NACA chieftains. On 5 March 1945, he wrote to the NACA's director of research, George W. Lewis. "I have recently made a theoretical analysis which indicates that a V-shaped wing traveling point foremost would be less affected by compressibility than other planforms," he explained. "In fact, if the angle of the V is kept small relative to the Mach angle, the lift and center of pressure remain the same at speeds both above and below the speed of sound." So much for theory. Only testing would provide the data to make or break Jones's theory. Langley personnel went to work, fabricating two small models to see what would happen. Technicians mounted the first model on the wing of a P-51 Mustang. The plane's pilot took off and climbed to a safe altitude before nosing over into a high-speed dive towards the ground. In this attitude, the accelerated flow of air over the Mustang's wing was supersonic, and the instrumented model on the plane's wing began to generate useful data. For wind tunnel tests, the second model was truly a diminutive article, crafted of sheet steel by Jones and two other engineers. Langley's supersonic tunnel had a 9-inch throat, so the model had a 1.5-inch wingspan, in the shape of a delta. The promising test results, issued 11 May 1945, were released before Allied investigators in Europe had the opportunity to interview German aerodynamicists on delta shapes and swept wing developments. Jones was already at work on variations of the delta, including his own version of the swept wing configuration. Late in June 1945, he published a summary of this work as NACA Technical Note Number 1033. Jones suggested that the proposed supersonic plane under development should have swept wings, but designers opted for a more conservative approach. Other design staffs were fascinated by the promise of swept wings especially after the appearance of the German aerodynamicists in America. The Germans arrived courtesy of "Operation Paperclip," a high-level government plan to scoop up leading German scientists and engineers during the closing months of World War II. Adolf Busemann eventually wound up at NACA's Langley laboratory, and scores of others joined Air Force, Army, and contractor staffs throughout the United States. Information from the research done by Robert Jones had begun to filter through the country's aeronautical community before the Germans arrived. Their presence, buttressed by the obvious progress represented by advanced German aircraft produced by 1945, bestowed the imprimatur of proof to swept wing configurations. At Boeing, designers at work on a new jet bomber tore up sketches for a conventional plane with straight wings and built the B-47 instead. With its long, swept wings, the B-47 launched Boeing into a remarkably successful family of swept wing bombers and jet airliners. At North American, a conventional jet fighter with straight wings, the XP-46, went through a dramatic metamorphosis, eventually taking to the air as the famed F-86 Sabre, a swept wing fighter that racked up an enviable combat record during the Korean conflict in the 1950s. Nonetheless, America had been demonstrably lagging in jets and swept wing aircraft in 1945, and the NACA was the target of criticism from postwar Congressional and Air Force committees. It may have been that the NACA was not as bold as it might have been or that the agency was so caught up in immediate wartime improvements that crucial areas of basic research received short shrift. There were administrative changes to respond to these issues. In any case, as historian Alex Roland noted in his study of the NACA, Model Research (1985), its shortcomings "should not be allowed to mask its real significant contributions to American aerial victory in World War II." Moreover, the NACA's postwar achievements in supersonic research and rapid transition into astronautics reflected a new vigor and momentum. During World War II, the increasing speeds of fighter aircraft began to create new problems. The Lockheed P-38 Lightning, for example, could exceed 500 MPH in a dive. In 1941, a Lockheed test pilot died when shock waves from the plane's wings (where the air flow over the wings reached 700 MPH) created turbulence that tore away the horizontal stabilizer, sending the plane into a fatal plunge. From wind tunnel tests, researchers knew something about the shock waves occurring at Mach 1, the speed of sound. The phenomenon was obviously attended by danger. Pilots and aerodynamicists alike muttered about the threatening dimensions of what came to be called the sound barrier. Researchers faced a dilemma. In wind tunnels, with models exposed to near-sonic velocities, shock waves began bouncing from the tunnel walls, the "choking" phenomenon, resulting in questionable data. In the meantime, high speed combat maneuvers brought additional reports of control loss due to turbulence and, in several cases, crashes involving planes whose tails had wrenched loose in a dive. Since data from wind tunnels remained unreliable, researchers proposed a new breed of research plane to probe the sound barrier. Two of the leaders were Ezra Kotcher, a civilian on the Air Force payroll, and John Stack, on the NACA staff at Langley. By 1944, John Stack and his NACA research team proposed a jet powered aircraft, a conservative, safe approach to high speed flight tests. Kotcher's group wanted a rocket engine which was more dangerous, with explosive fuels aboard, but more likely to achieve the high velocity to reach the speed of sound. The Air Force had the funds, so Stack and his colleagues agreed. The next problem involved design and construction of the rocket plane. Eventually, the contract went to Bell Aircraft Corporation in Buffalo, New York. The company had a reputation for unusual designs, including the first American jet, the XP-59A Airacomet. The designer was Robert J. Woods, who had worked with John Stack at Langley in the 1920s before he joined Bell Aircraft. Woods had close contacts with the NACA as well as the Air Force. During a casual visit to Kotcher's office at Wright Field, Woods agreed to design a research plane capable of reaching 800 MPH at an altitude of 35,000 feet. Woods then called his boss, Lawrence Bell, to break the news. "What have you done?" Bell lamented, only half in jest. The Bell design team worked closely with the Air Force and the NACA. This was the first time that the Langley staff had been involved in the initial design and construction of a complex research plane. Even with the Air Force bearing the cost and sharing the research load, this sort of collaboration marked a significant departure in NACA procedures. For the most part, design issues were amicably resolved, although some questions caused heated exchanges. The wing design was one such controversy. There was general agreement that the wings would be thinner than normal in order to delay the formation of shock waves. In conventional designs, this was expressed as a numerical figure (usually between 12 to 15) which was the ratio of the wing's thickness to its chord. One group of NACA researchers advocated a 10 percent wing for the new plane, while others argued for an 8 percent thickness in order to forestall the effect of shock waves even more. One of Langley's resident experts on wing design finally made a thorough analysis of the issue and advised the 8 percent thickness as the most promising to achieve supersonic speed. As the design of the plane progressed, Bell's engineers came up with a plane that measured only 31 feet long with a wingspan of just 28 feet. Stresses on the remarkably short wing were estimated at twice the levels for high performance fighters of the day. Fortunately, Bell's designers realized that thickening the aluminum skin of the wings would result in a robust structure. Consequently, the skin thickness at the wing root measured .5 inch compared to .10-inch thick wing skin on a conventional fighter. Research at Langley influenced other aspects of the design. Realizing that turbulence from the wing might create control problems around the tail, John Stack advised Bell to place the horizontal stabilizer on the fin, above the turbulent flow. He also recommended a stabilizer that was thinner than the wing, ensuring that shock waves would not form on the wing and tail at the same time, thereby improving the pilot's control over the accelerating aircraft. In making these decisions, the design team recognized that not much was known about the flight speeds for which the plane was intended. On the other hand, there was some interesting aerodynamic information available on the .50 caliber bullet, so the fuselage shape was keyed to ballistics data from this unlikely source. The cockpit was installed under a canopy that matched the rounded contours of the fuselage, since a conventional design atop the fuselage created too much drag. The engine was one of the few really exotic aspects of the supersonic plane. Jet engines under development fell far short of the required thrust to reach Mach 1, forcing designers to consider rocket engines, a radical new technology for that time. The original engine candidate came from a small Northrop design for a flying wing. The propellants, red fuming nitric acid and aniline, ignited spontaneously when mixed. Curious about this volatile combination, some Bell engineers obtained some samples, put the stuff in a pair of bottles taped together, found some isolated rocks outside the plant, and tossed the bottles into them. They were aghast at the fierce eruption that followed. Considering the consequences to the plane and its pilot in case of a landing accident or a fuel leak, a different propulsion system seemed imperative. They settled on a rocket engine supplied by an outfit aptly named Reaction Motors, Incorporated. The engine burned a mixture of alcohol and distilled water along with liquid oxygen to produce a thrust of 1500 pounds from each of four thrust chambers. Due to limited propellant capacity of the research plane, the design team decided to use a Boeing B-29 Superfortress to carry it to about 25,000 feet. After dropping from the B-29 bomb bay, the pilot would ignite the rocket engine for a high-speed dash; with all its fuel consumed, the plane would have to glide earthward and make a deadstick landing. By this time, the plane was designated the XS-1, for Experimental Sonic 1, soon shortened to X-1 by those associated with it. Early in 1946, flight trials began. The rocket engine was not ready, so the test crew moved into temporary quarters at Pinecastle Field, near Orlando, Florida. The X-1, painted a bright orange for high visibility, was carried aloft for a series of drop tests. By autumn, the X-1 was transferred to a remote air base in California's Mojave Desert--Muroc Army Air Field, familiarly known as Muroc,1 after a small settlement on the edge of Rogers Dry Lake. This was the Air Force flight test center, an area of 300 square miles of desolation in the California desert northwest of Los Angeles. Originating as an Air Force bombing and gunnery range, Muroc was a suitably remote location; the concrete-hard lake bed was highly suited for experimental testing. Test aircraft not infrequently made emergency landings, and the barren miles of Rogers Dry Lake allowed these unscheduled approaches from almost any direction. This austere, almost surrealistic desert setting made an appropriate environment for a growing roster of exotic planes based there in the postwar years. The X-1 arrived under a cloud of gloom from overseas. The British had also been developing a plane to pierce the sound barrier, the de Havilland D.H. 108 Swallow, a swept wing, jet propelled, tailless airplane. Geoffrey, a son of the firm's founder, died during a high-speed test of the sleek aircraft in September 1946. The barrier was deadly. Through the end of 1946 and into the autumn of 1947, one test flight after another took the X-1 to higher speeds, past Mach .85, the region where statistics on subsonic flight more or less faded away. On the one hand, the X-1 test crew felt increasing confidence that their plane could successfully make the historic run. On the other hand, NACA engineers like Walt Williams grudgingly admitted "a very lonely feeling as we began to run out of data." The Air Force and the NACA put considerable trust in the piloting skills of Captain Charles "Chuck" Yeager, a World War II fighter ace. During the test sequences, he learned to keep his exuberance under control and to acquire a thorough knowledge of the X-1's quirks. On the morning of 14 October 1947, the day of the supersonic dash, Yeager's aggressive spirit helped him overcome the discomfort of two broken ribs, legacy of a horseback accident a few days earlier. A close friend helped the wincing Yeager into the cramped cockpit, then slipped him a length of broom handle so that he could secure the safety latch with his left hand, since the broken ribs on his right side made it too painful to use his right hand. The latch secure, Yeager reported he was ready to go. At 20,000 feet above the desert, the X-1 dropped away from the B-29. Yeager fired up the four rocket chambers and shot upwards to 42,000 feet. Leveling off, he shut down two of the chambers while making a final check of the plane's readiness. Already flying at high speed, Yeager fired a third chamber and watched the instruments jump as buffeting occurred. Then the flight smoothed out; needles danced ahead as the X-1 went supersonic. Far below, test personnel heard a loud sonic boom slap across the desert. The large data gap mentioned by Walt Williams had just been filled in. A need for high-speed wind tunnel tests still existed. In the 7 x 10-foot tunnel at Langley, technicians built a hump in the test section; as the air stream accelerated over the hump, models could be tested at Mach 1.2 before the "choking" phenomenon occurred. A research program came up with the idea of absorbing the shock waves by means of longitudinal openings, or slots, in the test section. The slotted-throat tunnel became a milestone in wind tunnel evolution, permitting a full spectrum of transonic flow studies. In another high-speed test program, Langley used rocket-propelled models, launching them from a new test facility at Wallops Island, north of Langley on the Virginia coast. This became the Pilotless Aircraft Research Division (PARD), established in the autumn of 1945. During the next few years, PARD used rocket boosters to make high-speed tests on a variety of models representing new planes under development. These included most of the subsonic and supersonic aircraft flown by the armed services during the decades after World War II. In the 1960s, PARD facilities supported the Mercury, Gemini, and Apollo programs as well. As full-sized aircraft took to the air, new problems inevitably cropped up. Researchers soon realized that a sharp increase in drag occurred in the transonic region. Slow acceleration through this phase of flight consumed precious fuel and also created control problems. At Langley, Richard T. Whitcomb became immersed in the problem of transonic drag. In the course of his analysis, Whitcomb developed a hunch that the section of an airplane where the fuselage joined the wing was a key to the issue. After listening to some comments by Adolph Busemann on airflow characteristics in the transonic regime, Whitcomb hit upon the answer to the drag problem- -the concept of the area rule. Essentially, the area rule postulated that the cross-section of an airplane should remain reasonably constant from nose to tail, minimizing disturbance of the air flow and drag. But the juncture of the wing root to the fuselage of a typical plane represented a sudden increase in the cross-sectional area, creating the drag that produced the problems encountered in transonic flight. Whitcomb's solution was to compensate for this added wing area by reducing the area of the fuselage. The result was the "wasp-waisted" look, often called the "Coke bottle" fuselage. Almost immediately, it proved its value. A new fighter, Convair's XF-102, was designed as a supersonic combat plane but repeatedly frustrated the efforts of test pilots and aerodynamicists to achieve its design speed. 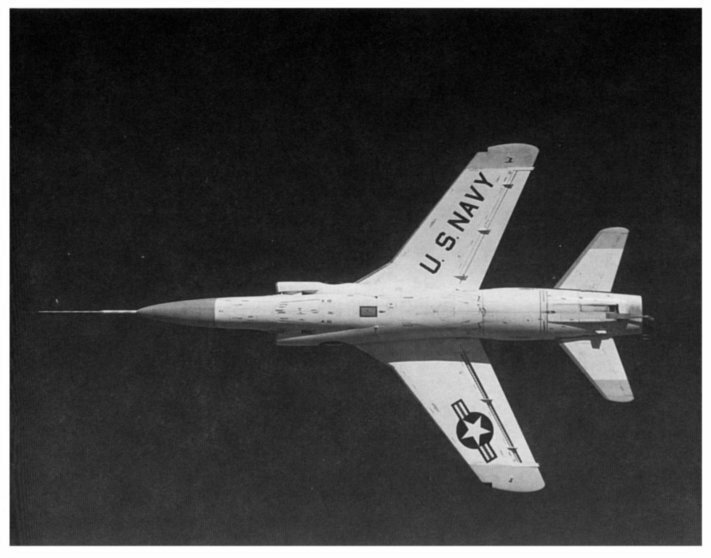 Rebuilt with an area rule fuselage, the XF-102 sped through the transonic region like a champion; the Coke bottle fuselage became a feature on many high performance aircraft of the era: the F-106 Delta Dart (successor to the F-102), Grumman F-11, the Convair B-58 Hustler bomber, and others. A succession of X aircraft, designed primarily for flight experiments, populated the skies above Muroc in a continuous cycle of research and development (R&D). Two more X-1 aircraft were ordered by the Air Force, followed by the X-1A and the X-1B, which investigated thermal problems at high speeds. 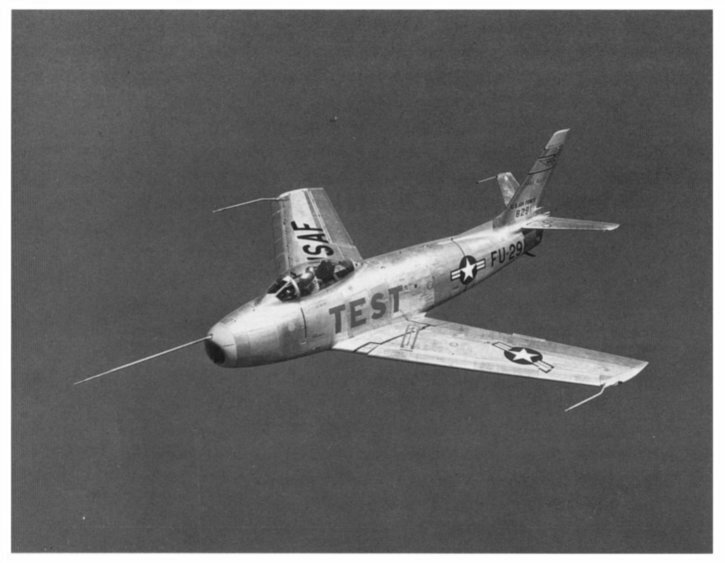 The Navy used the Muroc flight test area for the subsonic jet-powered Douglas Skystreak, accumulating air-load measurements unobtainable in early postwar wind tunnels. The Skystreak was followed by the Douglas Skyrocket, a swept wing research jet (later equipped with a rocket engine that would surpass twice the speed of sound for the first time in 1953). The Douglas X-3, which fell short of expectation for further flight research in the Mach 2 range, nevertheless yielded important design insights on the phenomenon of inertial coupling (solving a control problem for the North American F-100 Super Sabre), the structural use of titanium (incorporated in the X-15 and other subsequent supersonic fighter designs), and data applied in the design of the Lockheed F-104 Starfighter. The NACA kept involved throughout these programs. In a number of ways, the X aircraft contributed substantially to the solution of a variety of high-speed flight conundrums and enhanced the design of future jet airliners, establishing a record of consistent progress aside from the speed records that so fascinated the public. This photo taken from below the Grumman F-11 Navy fighter illustrates the way in which the area-ruled fuselage was adapted to production aircraft. Although much of the NACA's work in this era had to do with military aviation, a good number of aerodynamic lessons were applicable to nonmilitary research planes and to civil aircraft. In the late 1950s, the Air Force began developing the North American XB-70, an unusually complex bomber capable of sustained supersonic flight over long distances. As a high-altitude strategic bomber, the B-70 was eventually displaced by ballistic missiles and a tactical shift to the idea of low-altitude strikes to avoid enemy radars and antiaircraft rockets. The Air Force and the NACA continued to fly the plane for research. Despite the loss of one of the two prototypes in a tragic midair collision involving a chase plane, the remaining XB-70 generated considerable data on long- range, high-altitude supersonic operations. This data was useful in designing new generations of jet transports operating in the transonic region, as well as advanced military aircraft. Helicopters, introduced into limited combat service at the end of World War II, entered both military and civilian service in the postwar era. The value of helicopters in medical evacuation was demonstrated time and again in Korea, and a variety of helicopter operations proliferated in the late 1950s. 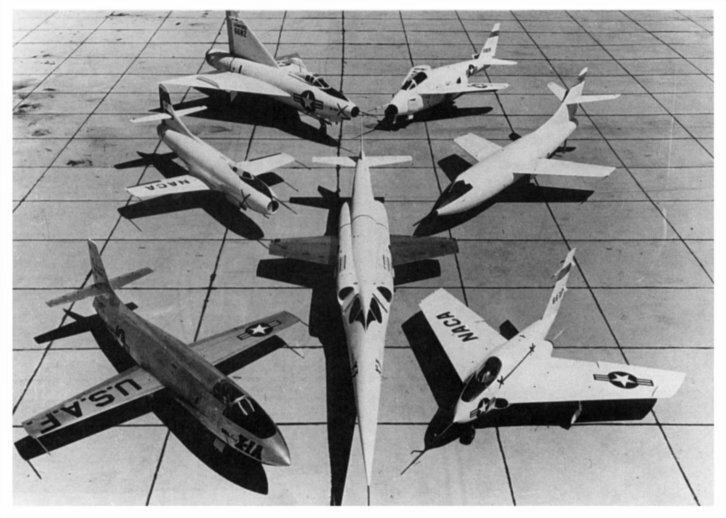 The NACA flight-tested new designs to help define handling qualities. Using wind tunnel experience, researchers also developed a series of special helicopter airfoil sections, and a rotor test tower aided research in many other areas. As usual, NACA researchers also pursued a multifaceted R&D program touching many other aspects of flight. In one project, the NACA installed velocity-gravity-altitude recorders in aircraft flown in all parts of the world. The object was to acquire information about atmospheric turbulence and gusts so that designers could make allowances for such perturbations. At Langley, a Landing Loads Track Facility went into operation, using a hydraulically propelled unit that subjected landing gear to the stresses of repeated landings in a variety of conditions. Another test facility studied techniques in designing pressurized fuselage structures to avoid failures. In the mid-1950s, a rash of such failures in the world's first operational jet airliner, the British-built de Havilland Comet, dramatized the rationale for this kind of testing. All of this postwar aeronautical activity received respectful and enthusiastic attention from press and public. Although the phenomenon of flight continued to enjoy extensive press coverage, events in the late 1950s suddenly caused aviation to share the limelight with space flight. Among the legacies of World War II was a glittering array of new technologies spawned by the massive military effort. Atomic energy, radar, antibiotics, radio telemetry, the computer, the large rocket, and the jet engine seemed destined to shape the world's destiny in the next three decades and heavily influence the rest of the century. The world's political order had been drastically altered by the war. Much of Europe and Asia were in ashes. Old empires had crumbled; national economies were tottering perilously. On opposite sides of the world stood the United States and the Soviet Union, newly made into superpowers. It soon became apparent that they would test each other's mettle many times before a balance of power stabilized. And each nation moved quickly to exploit the new technologies. The atomic bomb was the most obvious and most immediately threatening technological change from World War II. Both superpowers sought the best strategic systems that could deliver the bomb across the intercontinental distances that separated them. Jet-powered bombers were an obvious extension of the wartime B-17 and B-29, and both nations began putting them into service. The intercontinental rocket held great theoretical promise, but seemed much further down the technological road. Atomic bombs were bulky and heavy; a rocket to lift such a payload would be enormous in size and expense. The Soviet Union doggedly went ahead with attempts to build such rockets. The American military temporarily settled upon jet aircraft and smaller research and battlefield rockets. The Army imported Wernher von Braun and the German engineers who had created the wartime V-2 rockets and set them to overseeing the refurbishing and launching of V-2s at White Sands, New Mexico. The von Braun team was later transferred to Redstone Arsenal, Huntsville, Alabama, where it formed the core of the Army Ballistic Missile Agency (ABMA). With its contractor the Jet Propulsion Laboratory (JPL), the Army developed a series of battlefield missiles known as Corporal, Sergeant, and Redstone. The Navy designed and built the Viking research rockets. The freshly independent Air Force started a family of cruise missiles, from the jet Bomarc and Matador battlefield missiles to Snark and the ambitious rocket-propelled Navaho, which were intended as intercontinental weapons. By 1951 progress on a thermonuclear bomb of smaller dimensions revived interest in the long-range ballistic missile. Two months before President Truman announced that the United States would develop the thermonuclear bomb, the Air Force contracted with Consolidated Vultee Aircraft Corporation (later Convair) to resume study, and then to develop, the Atlas intercontinental ballistic missile, a project that had been dormant for four years. During the next four years three intermediate range missiles; the Army's Jupiter, the Navy's Polaris, and the Air Force's Thor; and a second generation ICBM, the Air Force's Titan, had been added to the list of American rocket projects. All were accorded top national priority. Fiscal 1953 saw the Department of Defense (DoD) for the first time spend more than $1 million on missile research, development, and procurement. Fiscal 1957 saw the amount go over the $1 billion mark. By the mid-1950s NACA had modern research facilities that had cost a total of $300 million, and a staff totaling 7200. Against the background of the "Cold War" between the U.S. and the U.S.S.R. and the national priority given to military rocketry, the NACA's sophisticated facilities inevitably became involved. With each passing year it was enlarging its missile research in proportion to the old mission of aerodynamic research. Major NACA contributions to the military missile programs came in 1955-1957. Materials research led by Robert R. Gilruth at Langley confirmed ablation as a means of controlling the intense heat generated by warheads and other bodies reentering the Earth's atmosphere; H. Julian Allen at Ames demonstrated the blunt-body shape as the most effective design for reentering bodies; and Alfred J. Eggers at Ames did significant work on the mechanics of ballistic reentry. The mid-1950s saw America's infant space program burgeoning with promise and projects. As part of the U.S. participation in the forthcoming International Geophysical Year (IGY), it was proposed to launch a small satellite into orbit around the Earth. After a spirited design competition between the National Academy of Sciences-Navy proposal (Vanguard) and the ABMA-JPL candidate (Explorer), the Navy design was chosen in September 1955 as not interfering with the high-priority military missile programs, since it would use a new booster based on the Viking research rocket, and having a better tracking system and more scientific growth potential. By 1957 Vanguard was readying its first test vehicles for firing. The U.S.S.R. had also announced it would have an IGY satellite; the space race was extending beyond boosters and payloads to issues of national prestige. On the military front, space activity was almost bewildering. The missiles were moving toward the critical flight-test phase. Satellite ideas were proliferating, though mostly on a sub-rosa planning basis; after Sputnik these would become Tiros, weather satellite; Transit, navigation satellite; Pioneer lunar probes; Discoverer research satellites; Samos, reconnaissance satellite; Midas, missile early-warning satellite. Payload size and weight were constant problems in all these concepts, with the limited thrust of the early rocket engines. Here the rapid advances in solid-state electronics came to the rescue by reducing volume and weight; with new techniques such as printed circuitry and transistors, the design engineers could achieve new levels of miniaturization of equipment. Even so, heavier payloads were obviously in the offing; more powerful engines had to be developed. So design was begun for several larger engines, topped by the monster F-1 engine, intended to produce eight times the power of the engines that lifted the Atlas, Thor, and Jupiter missiles. All this activity, however, was still on the drawing board, work bench, or test stand on 4 October 1957, when the "beep, beep" signal from Sputnik 1 was heard around the world. The Soviet Union had orbited the world's first man-made satellite. The American public's response was swift and widespread. It seemed equally compounded of alarm and chagrin. American certainty that the nation was always number one in technology had been rudely shattered. Not only had the Russians been first, but Sputnik 1 weighed an impressive 183 pounds against Vanguard's intended start at 3 pounds and working up to 22 pounds in later satellites. In a cold war environment, the contrast suggested undefined but ominous military implications. Fuel for such apprehensions added up rapidly. Less than a month after Sputnik 1 the Russians launched Sputnik 2, weighing a hefty 1100 pounds and carrying a dog as passenger. President Eisenhower, trying to dampen the growing concern, assured the public of our as yet undemonstrated progress and denied there was any military threat in the Soviet space achievements. As a counter, the White House announced the impending launch in December of the first Vanguard test vehicle capable of orbit and belatedly authorized von Braun's Army research team in Huntsville to try to launch their Explorer-Jupiter combination. But pressures for dramatic action gathered rapidly. The media ballyhooed the carefully qualified announcement on Vanguard into great expectations of America's vindication. On 25 November Lyndon B. Johnson, Senate majority leader, chaired the first meeting of the Preparedness Investigation Subcommittee of the Senate Armed Services Committee. The hearings would review the whole spectrum of American defense and space programs. A ball of fire and flying debris mark the explosive failure of the first American attempt to launch a satellite on Vanguard, 6 December 1957. Still the toboggan careened downhill. 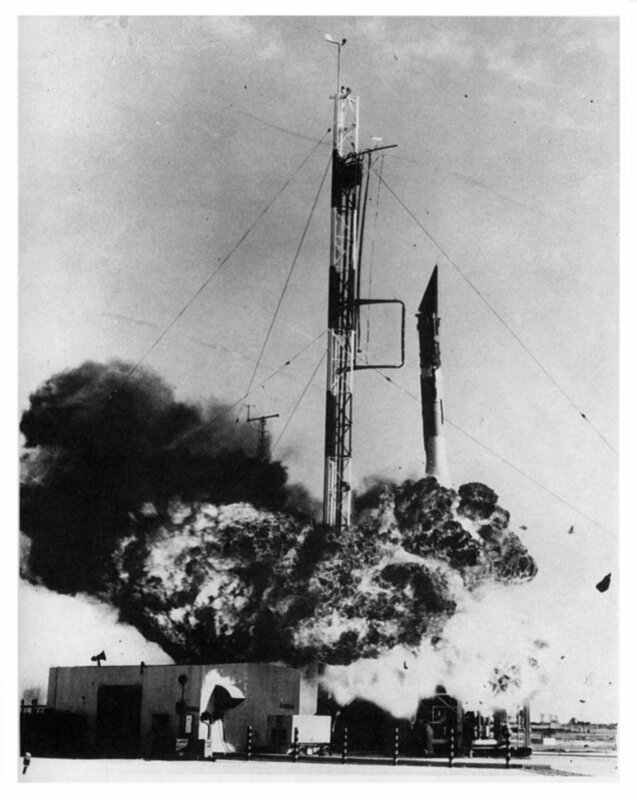 On 6 December 1957, the much-touted Vanguard test vehicle rose about 3 feet from the launch platform, shuddered, and collapsed in flames. Its tiny 3-pound payload broke away and lay at the edge of the inferno, beeping impotently. A moment of triumph with the announcement that Explorer I has become the first American satellite to orbit the Earth. 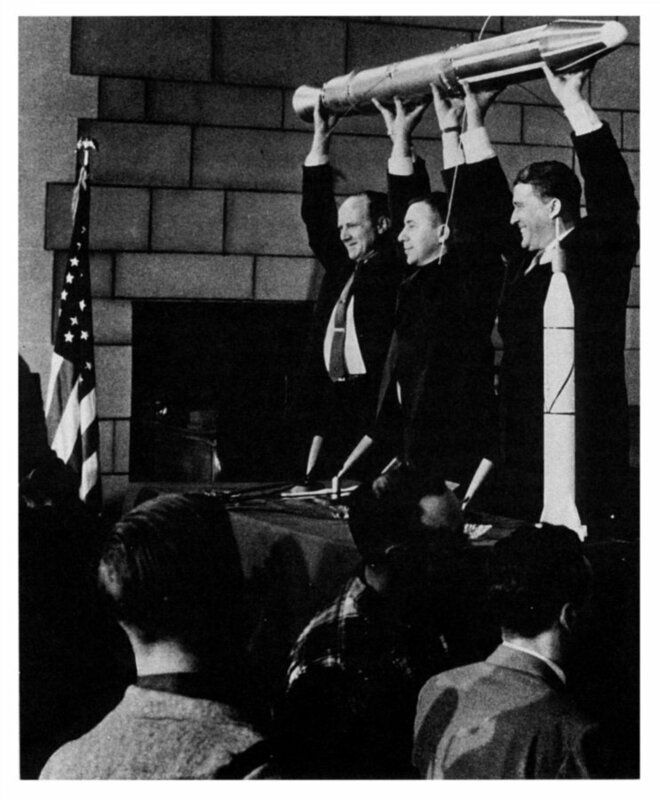 Here a duplicate Explorer is held aloft by (left to right) William H. Pickering of JPL, James A. van Allen of the State University of Iowa, and Wernher von Braun of the ABMA. Clouds of gloom deepened into the new year. Then, finally, a small rift. On 31 January 1958, an American satellite at last went into orbit. Not Vanguard but the ABMA-JPL Explorer had redeemed American honor. True, the payload weighed only 2 pounds against the 1100 of Sputnik 2. But there was a scientific first; an experiment aboard the satellite reported mysterious saturation of its radiation counters at 594 miles altitude. Professor James A. van Allen, the scientist who had built the experiment, thought this suggested the existence of a dense belt of radiation around the Earth at that altitude. American confidence perked up again on 17 March when Vanguard 1 joined Explorer 1 in orbit. Meanwhile, in these same tense months, both consensus and competition had been forming on the political front; consensus that an augmented national space program was essential; competition as to who would run such a program, in what form, with what priorities. The DoD, with its component military services, was an obvious front runner; the Atomic Energy Commission, already working with nuclear warheads and nuclear propulsion, had some congressional support, particularly in the Joint Committee on Atomic Energy; and there was NACA. NACA had devoted more and more of its facilities, budget, and expertise to missile research in the mid- and late 1950s. Under the skillful leadership of James H. Doolittle, chairman, and Hugh L. Dryden, director, the strong NACA research team had come up with a solid, long-term, scientifically based proposal for a blend of aeronautic and space research. Its concept for manned spaceflight, for example, envisioned a ballistic spacecraft with a blunt reentry shape, backed by a world-encircling tracking system, and equipped with dual automatic and manual controls that would enable the astronaut gradually to take over more and more of the flying of his spacecraft. Also NACA offered reassuring experience of long, close working relationships with the military services in solving their research problems, while at the same time translating the research into civil applications. But NACA's greatest political asset was its peaceful, research-oriented image. President Eisenhower and Senator Johnson and others in Congress were united in wanting above all to avoid projecting cold war tensions into the new arena of outer space. By March 1958 the consensus in Washington had jelled. The administration position (largely credited to James R. Killian in the new post of president's special assistant for science and technology), the findings of Johnson's Senate subcommittee, and the NACA proposal converged. America needed a national space program. The military component would of course be under DOD But a civil component, lodged in a new agency, technologically and scientifically based, would pick up certain of the existing space projects and forge an expanded program of space exploration in close concert with the military. All these concepts fed into draft legislation. On 2 April 1958, the administration bill for establishing a national aeronautics and space agency was submitted to Congress; both houses had already established select space committees; debate ensued; a number of refinements were introduced; and on 29 July 1958 President Eisenhower signed into law P.L. 85-568, the National Aeronautics and Space Act of 1958. The act established a broad charter for civilian aeronautical and space research with unique requirements for dissemination of information, absorbed the existing NACA into the new organization as its nucleus, and empowered broad transfers from other government programs. The National Aeronautics and Space Administration came into being on 1 October 1958. All this made for a very busy spring and summer for the people in the small NACA Headquarters in Washington. Once the general outlines of the new organization were clear, both a space program and a new organization had to be charted. In April, Dryden brought Abe Silverstein, assistant director of the Lewis Laboratory, to Washington to head the program planning. Ira Abbott, NACA assistant director for aerodynamic research, headed a committee to plan the new organization. In August President Eisenhower nominated T. Keith Glennan, president of Case Institute of Technology and former commissioner of the Atomic Energy Commission, to be the first administrator of the new organization, NASA, and Dryden to be deputy administrator. Quickly confirmed by the Senate, they were sworn in on 19 August. Glennan reviewed the planning efforts and approved most. Talks with the Advanced Research Projects Agency identified the military space programs that were space science-oriented and were obvious transfers to the new agency. Plans were formulated for building a new center for space science research, satellite development, flight operations, and tracking. A site was chosen, nearly 500 acres of the Department of Agriculture's research center in Beltsville, Maryland. The Robert H. Goddard Space Flight Center (named for America's rocket pioneer) was dedicated in March 1961.